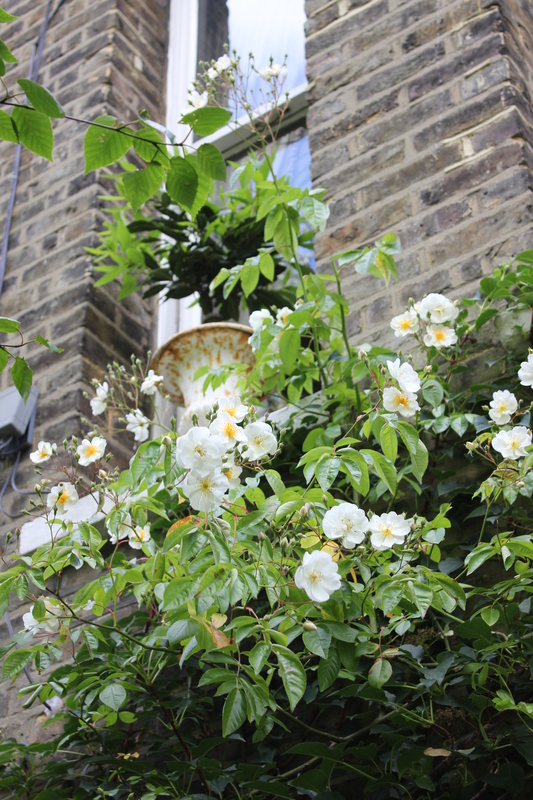 About ten years ago I bought a rambling rose. I was inspired by the rose arbour in the white garden at Sissinghurst, which is festooned in June with an ancient and prolific Rosa Mulliganii. Unable to provide one at the time, David Austin suggested Bobbie James which apparently is a close match. The first year it did well, sending out its shoots right across the east-facing wall. However the following year I noticed a distinct lack of vigour in its appearance. Close inspection revealed that it had been chewed and severed just above the root, and was in fact just hanging like a horticultural crucifixion. Since this early setback, it has had about eight years of uninterrupted growth, giving it the opportunity to do what it is supposed to do. I have to say, it has done it very well. Its natural trajectory in the first years was away from the house towards the light. And on its way it found the large Silver Birch. I’m not sure at what point I actually noticed the extent to which it had made the tree its home, but somehow, by stealth, it has climbed its way almost to the topmost branches, where, running out of further structural support, it has started to tumble back down towards the ground. In the early part of the year the fresh green leaves of the rose are not immediately distinguishable from those of the birch, so it isn’t until mid to late June when the rose starts to flower that its impact is felt. For about two weeks of the year, usually from about the 20th June (yes, I’ve made notes), the rest of the garden seems to sit back and stop competing. Bobbie James takes centre stage and its performance can be jaw-dropping. Its scent alone is almost enough to stop me in my tracks. When I open the doors in the morning it hits me, and the whole tree seems to shimmer in the filtered light, it’s thousands of blooms illuminated in the morning sun. Of course there is a down side. At the end of the two-week run, the show ends. Exhausted, the rose drops its petals like confetti over the garden and I am left to sweep them up. That is a great rose. I’m very partial to roses that have a fragrance. I will have to look up Bobbie James, not that I have much more room for another rose. I’ve never heard of this rose. Wonder who Bobbie James is/was? According to David Austin, this rose was introduced in 1899. Other authorities, including the French Wikipedia site say 1961. Nothing out there on who Bobbie James was, but I’m now keen to find out!